From January 19 to March 18, Laurence and Denis will present the TCH Collection at Galerie Vauclair. Toma Clark Haines is of The Antiques Diva® & Co, the world’s largest antique touring company, In 2018, she launched the TCH Collection, a splendid collection of jewelry inspired by the 19th century. 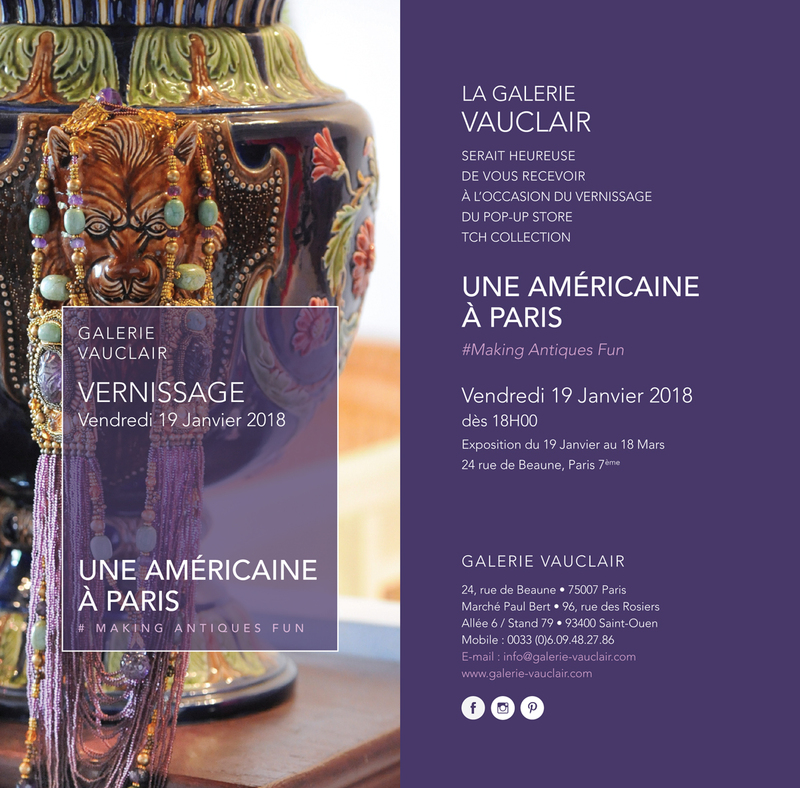 For the launch of thiscollection, Galerie Vauclair becomes the privileged setting for a collection of creationsin shimmering colors, in dialogue with ceramics of the Palissy Ware and the opulent Napoleon III period furniture. Imagine Alice in Wonderland and Princess Mathilde’s veranda as the backdrop of daydreams at the Galerie Vauclair! It is the opposite spectrum of a classic display of antiques and decorative art galleries. It’s about making life – and antiques – fun! To sublimate this decor, Toma collaborated with Fromental, creator of hand-painted silk wallpaper in audacious metallic colors. Immerse yourself in the dreamlike and fantasy universe of these three antiques lovers. Friday, January 19,2018 from 6:00 p. m.